Graduation is in the air during the month of June. 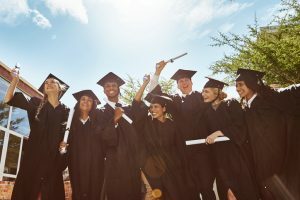 Whether that graduation is from Junior High School, Senior High School or College, we want to express our hardiest congratulations to all of our graduates in Houston and Bellaire TX. In many instances, parents often deserve congratulations as well for helping with homework, making sure their students arrive at school or the bus on time and for just being supportive. Here at Greater Houston Orthodontics, we understand that many of our patients are now embarking on a new path. Many are now off to college or if graduating college off to their new adult life and careers. Whatever the case may be, rest assured that a beautiful smile will serve you well. It will increase your confidence and appearance. After all, a smile is one of the first things people see when you are entering Junior or Senior high school, on a job interview or meeting your new dorm roommate in college. In order to ensure that the first impression you make is positive, consider getting that perfect smile you have always wanted. At Greater Houston Orthodontics, we offer many options for straightening teeth and being the owner of a great smile. We offer the highest and most advanced techniques in orthodontics. Treatments such as Invisalign, Invisible Braces, and Ceramic Braces are just a few of the options. During your initial complimentary consultation, we will recommend the best customized orthodontic solution for your particular case. If you have any questions about how we can help you get that great smile…contact us at our Memorial or West University office to schedule a complimentary initial consultation. Congratulations Graduates!